Where is Grand Canyon Scenic Airlines located? We have four air terminals. They are located in Boulder City, Nevada, at the South Rim (near the entrance to Grand Canyon National Park), at the West Rim of the Grand Canyon, and Page, Arizona. Visit our Why Scenic page for more information about our terminal locations. Do you offer tour narration in different languages? Visitors travel from all over the world to fly with us. Grand Canyon Scenic Airlines offers tour narration in 16 different languages for most tours we offer. Please specify which language(s) your party speaks when you book your reservation. Do you require identification or a passport to fly? All passengers must present one valid government-issued form of identification. Which days are tours available? Most tours we offer operate year round. However, there are some tours that are seasonal, such as tours involving a lengthy raft duration or include an overnight stay at Bar 10 Ranch. Does the airline provide round-trip shuttle service? From the Las Vegas area, Grand Canyon Scenic Airlines provides complimentary shuttle service to and from most major hotels on the main part of the Strip, which encompasses the area between the Stratosphere and Mandalay Bay. We also pick up at most major hotels in the Downtown area. If you're staying on or near the Strip and we do not pick up at your particular hotel, we would attempt to pick you up at hotel closest to where you're staying. At the South Rim, we do not provide airport shuttle service as many area hotels are within 10 minutes' driving time. Some hotels in Tusayan offer airport shuttle service. Inside the park, taxi service is available 24 hours a day with prior arrangement. The fare from the park to Grand Canyon National Park Airport is approximately $5/person each way. I am not staying at a hotel. Can I be picked up by shuttle? We only offer shuttle service to hotels. However, a passenger does not need to be staying at a hotel to be picked up at one. Passengers can make their way to the nearest major hotel to be picked up by one of our shuttles. Passengers may also drive themselves to our terminal where we provide guest parking. Please contact reservations to make arrangements at (702) 638-3300 or toll free (800) 634-6801. Do you customize tours for a group? Do you charter your aircraft? We do! Please contact our Groups department at groups@FlyGCSA.com. Layered clothing is recommended through the months of March to September, and winter clothing should be worn from October to mid-March. Wear sensible shoes. The ground at the location you are visiting is rough, rocky and uneven. It is important to wear sturdy, toe-covering shoes that can handle rough terrain. Sneakers or hiking boots are highly recommended. Are cameras allowed on the tours? Cameras and phones are allowed and encouraged, but please be aware that the use of "Selfie Sticks" and extending camera poles are strictly prohibited in and around the aircraft. 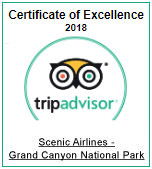 How do I book a tour with Grand Canyon Scenic Airlines? We encourage our customers to book online to take advantage of our best pricing. You may also book by telephone at (702) 638-3300 or toll free within the United States at (800) 634-6801. Can I book a tour when I arrive? Of course! We are happy to take your booking on arrival at one of our terminals. However, better prices are available online and our tours often sell out. It is recommended that you book in advance. Please allow 24 hours to receive your tour confirmation at the email address you entered during booking. 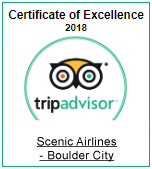 If you have not received it, please contact our reservations department at res@FlyGCSA.com. If I book in advance and then find a coupon, can I get the difference as a credit? No, coupon codes need to be mentioned at the time of booking. Coupons have limited offer dates, expiration dates or are based on availability. Please click here for our full cancellation policy. Most of our tours allow you to cancel or make changes to your reservation 24 hours before your departure time. Some tours require 72 hours before your departure time. Please refer to the Cancellation Policy under Terms and Conditions of your confirmation letter to determine which is applicable to your tour. To make such adjustments to your reservation, contact our reservations department at (702) 638-3300 or at res@FlyGCSA.com. What happens if I miss the tour? “No show” reservations will be cancelled if the passenger has not checked in at least 30 minutes prior to flight time. Our full cancellation policy will apply. I don’t know my travel dates at this point. Can I book a tour and leave the date open? No, we only permit tours to be booked for specific dates and times. We use industry standard security methods and encryption to protect both your credit card and your personal information during the booking process. I received an error/credit card declined message when I try to book. Who should I contact? Our reservation staff is very knowledgeable and will be happy to help you complete your booking. Do I need to pay for my tour in full at the time of booking, or can I pay at check-in? Grand Canyon Scenic Airlines requires that all tours to be paid in full at the time of booking. We do not allow for guests to pay at check-in. Do you have a fuel surcharge? Yes, however the surcharge is already included in the total quoted price of every tour. Are there any hidden fees or extra charges I need to pay at check-in? Absolutely not! The rate we quote you is the rate you pay. No guesswork, no unexpected taxes or fees. Do you have a surcharge for customers of size? Airplanes and helicopters have a maximum weight capacity as well as other restrictions that govern the balance of the aircraft. All airplane and/or helicopter passengers will be weighed at time of check in. Passengers exceeding 300lbs (136.36kg / 21.43 stone) will be charged a fee for an additional comfort seat. This fee is based on the product and ranges from $50 to $250. We're happy to answer any and all of your questions. Please contact us by email at info@FlyGCSA.com or by telephone at (702) 638-3300 or toll free (800) 634-6801.